Finding a great delay plugin can sometimes be a bit of a tough task, especially on a budget. Sure, there are plenty of fine delay plugins at a good price, but sometimes it takes a few attempts to find the right sound. Applied Acoustic Systems, or AAS, however, is here to change that with the AAS Objeq Delay. The Objeq Delay puts the power of acoustic modeling and modulation into one powerful plugin, according to the company’s website. But does it live up to that claim? Let’s take a look at how Objeq Delay can change how we work with a delay and create new unique textures in our recordings. At a basic level, the AAS Objeq Delay gives you two rounds of delay to add ambiance to an instrument. More interestingly, you can tweak our sound by running it though the “Object” panel, which models a beam, drumhead, plate or string. You can then tweak the modeling further with a resonance frequency, the decay time, material (which dictates the delay time of different frequencies of an object) and a formant control. The delay panel is fairly straightforward, allowing users to choose a delay time, as well as sync the first repeat with following echoes and control feedback. Additional high and low cut filters for the delay are included. The LFO module presents many more ways to vary the sound of Objeq Delay, with the destination selection allowing control over almost any parameter in the plugin. Setting the destination to the object frequency or material really creates depth and variance in the sound. This lends well to tight rhythmic parts in a synth track or drumbeat. 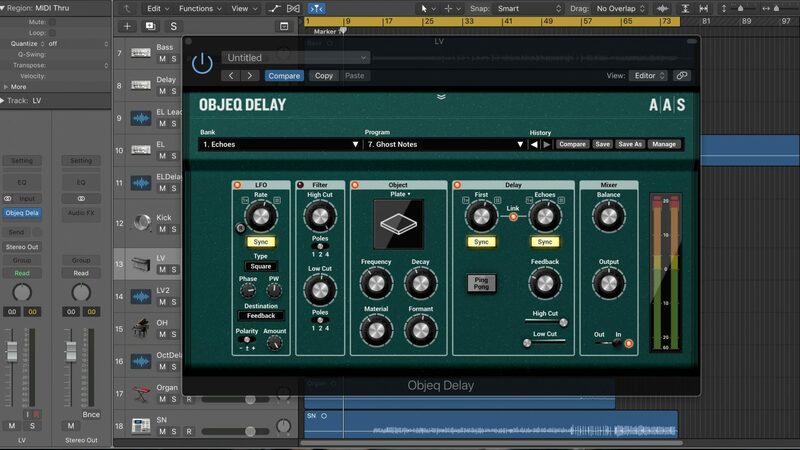 Although the AAS Objeq Delay allows for unique and un-traditional delay tones, the plugin is simple to work with and tweak. It’s easy to understand the left to right signal flow and know where to go to achieve the sound you’re looking for. Looking at the “Delay” panel, AAS added a clever menu that opens when clicking on the First control or Echoes control, that shows the note value for the delay you’re setting when synced to the host tempo. You can also multiply these values from half the value to twice the value to sync up the value you want. Notably, the 2/3 and 4/3 multiply values create unusual rhythms that are amusing to introduce into a track. Objeq Delay also comes with a great selection of presets to get started with and realize the potential of the acoustic modeling controls. For someone unfamiliar with acoustic modeling, the Objeq Delay manual gives insight into how the modeling options in the plugin can be used to enhance specific instruments, like a snare or kick drum. When other delay units lack in creative control, Objeq Delay is there to shake it up with high quality modeling and modulation control. Users can look forward to seeing Objeq Delay as an instrument in itself. With the plugin barely touching the CPU and a clean and intuitive interface, it can make find a home in any DAW setup. At $99, it’s a great option for those looking for a comprehensive and unique delay plugin. You can get the AAS Objeq Delay for yourself using the links below.